Our homemade, or better yet, "Child Made" wrapping paper looks a little bit like modern art - freeform shapes and lines that intersect in beautiful disarray! It looks a little bit like our Child Made Thank You Cards except we only used red white and green paint for this art project. It is a fun way for a child to give a gift that is from them. Eliana is currently using the phrase, "Eliana Give It!" for gifting presents to others - she uses the phrase for most of the presents we wrap. We decorated both brown and white rolls of paper - here they are tucked under the tree! Buy plain rolls of paper: We bought both brown and white. You can find these at any office store (we found ours at Target and Staples). 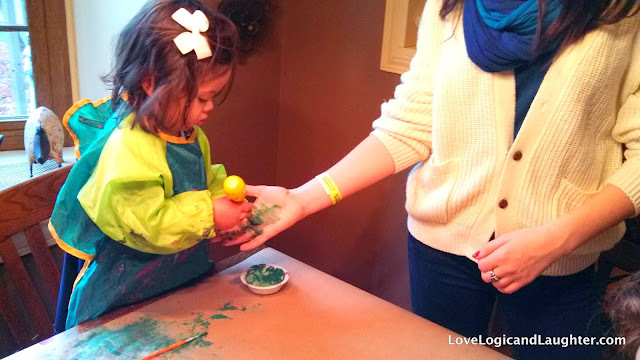 Plan out your space: We painted on our kitchen peninsula and kept moving Eliana from one side of the peninsula to the other so that she could decorate both sides of the paper (she couldn't reach all the way across from the one side. You also need to have space to continually unroll the paper as the paint goes on. We didn't have enough space to paint an entire roll in one sitting. We painted about a third of a roll per painting session. Provide child friendly paints and brushes: We used red white and green for our projects because we were making Christmas wrapping paper. 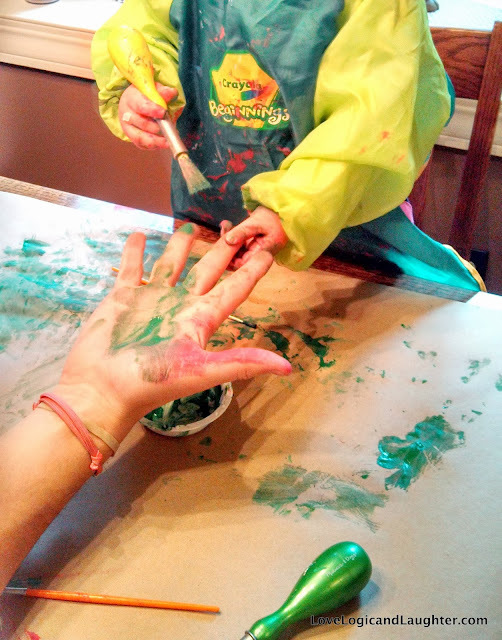 Get Creative: We painted some parts of the paper and stamped our hands for other parts of the paper. You could also use foam stamps, toilet paper rolls or cookie cutters to make other shapes on the paper. This was a fun project to do with Daddy - we had it all set up and ready to do together when he got home from work! Daddy did a good job wiping up the extra globs of paint Eliana would leave behind - he periodically put her initials on the paper with the extra globs of paint. Allow time for the paper to dry: We let our paper dry overnight. Then roll it back up so that it looks like a roll of wrapping paper again. When painting with a 2 year old the paint gets thick in areas - so allow plenty of time to dry! 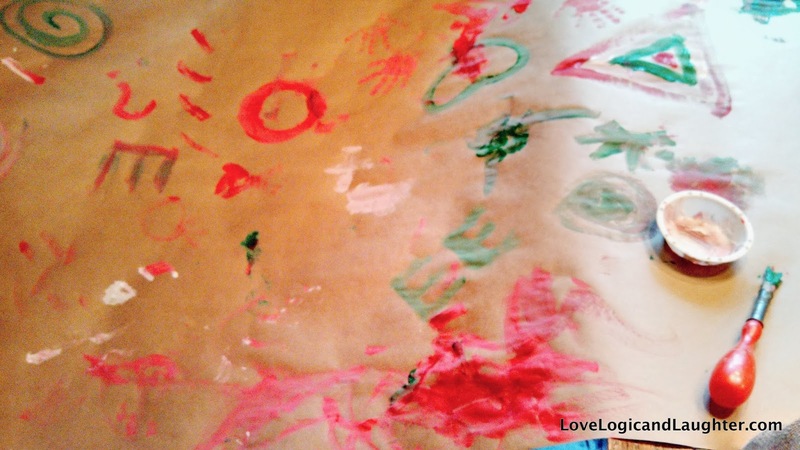 Wrap your presents: This paper is especially fun for gifts that are from children. We added ribbon to the wrapped gifts to finish them off! We painted in two sessions - one with the white paper and one with the brown paper. During the brown paper painting session, Eliana's Uncle Thomas came to participate along with his girlfriend. 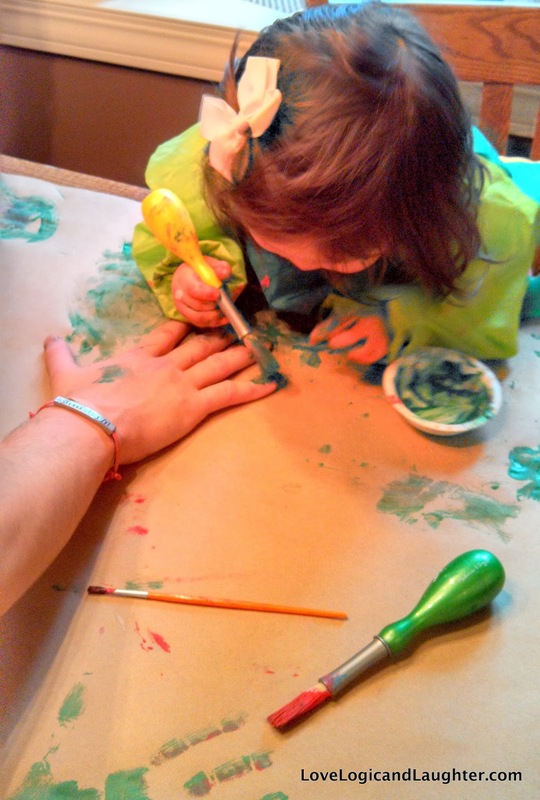 After painting her own hand and putting it on the paper, she loved painting their hands and stamping them on the paper too! Everyone got messy, but everyone had fun! It really can be a project for all ages! Ready to be opened Christmas morning!